A town hall meeting will be held on Sunday at 2 p.m. in the Bush Room. The report of the Task Force on the Undergraduate Educational Commons will be discussed. The Student Advisory Committee on the Recommendations on the Task Force will be compiling student feedback. E-mail edcomm-sac@mit.edu. Student group ownership will be discussed in an open meeting of the Undergraduate Association Senate Monday at 8 p.m. on the fourth floor of the Student Center. The report of the Task Force on Undergraduate Education Commons and Orientation is also on the agenda. The Amgen Scholars Program selected MIT as one of 10 program sites and also as the national program office. 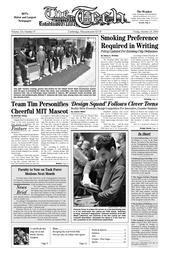 MIT will receive two $1 million grants, according to an MIT News Office press release. Both grants will last four years. One will fund summer research positions for 30 students, half of whom will be from MIT, while the other grant will fund the activities of the program’s national office. The Institute of Medicine elected three MIT faculty as members last week, according to an MIT News Office press release. HST professor Elazer R. Edelman and biology professors Rudolf Jaenisch and Susan L. Lindquist were elected. The Academy of Arts and Sciences inducted three MIT professors: — Timothy M. Swager of chemistry, K. Daron Acemoglu of economics, and Joshua Angrist of economics — according to an MIT News Office press release. Institute Professor Emilio Bizzi was also installed as the 44th president of the Academy.